Dr. David Biro is a physician, has a PhD in English literature from Oxford, and has experienced severe pain and illness himself. Drawing on this unique collection of experiences, he has written an interesting book, The Language of Pain. When we’re in pain, “there’s nothing but the pain.” Our world can shrink and we focus internally into our bodies. When we try to share our experience of pain, we’re often at a loss because language doesn’t do justice to our very difficult experience. We can’t really communicate what it’s like. As well, our family and friends have a hard time understanding how bad it can be when we say, “the pain is bad.” There’s a disconnect between exactly what we experience and the language available to us. This can result in our feeling isolated and misunderstood, and family and friends feeling left out, helpless, or questioning our levels of pain. Pain severs our engagement with the world and thrusts us inward. Naturally, we try to communicate our feelings, but the language runs dry… In pain, we are alone. Biro explores what it is about our experience of pain that’s unique – different from, let’s say, other physical experiences such as seeing a bird fly or tasting an orange. He uses examples of both physical and mental pain from literature and touches on philosophical ideas about pain. …a white-hot branding iron in the shape of the capital letter “I” held against my upper spine from the hairline downward some ten or twelve inches and unrelenting. Sharper, more penetrating still than the year before, the cold made her suffer, continually… icy puffs seemed to slip down her back and to penetrate between the flesh and her underclothing…. Innumerable currents of air appeared to have taken up their abode in the apartment, living, crafty currents of air as cruel as enemies. …they were incessantly buffeting, sometimes on the face, sometimes on the neck, with their treacherous, frozen breath. Metaphors can help us more clearly communicate what our expereince is like, and others can get a better sense of what pain feels like to us. Biro goes on to explore several ways that metaphors can be more useful and accurate than simply saying we’re in pain. Biro draws on cutting-edge science when me writes about mirror neurons – how certain cells in our brains are programmed to watch others. He also proposes using metaphors or imagery to help ourselves imagine healing. Overall, the book is weighted more heavily on the literature side, with some mentions of philosophy. It’s goal isn’t to be a self-help book for coping with pain. 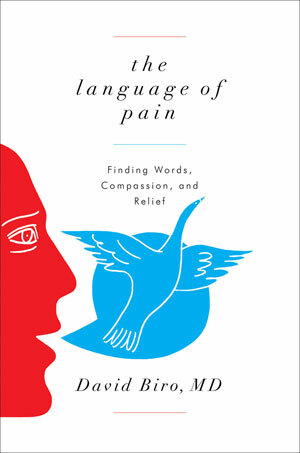 Rather, The Language of Pain would be of interest to those who would enjoy a literary exploration of the language of pain.